the figure itself is minty and comes with his knife. Color and joints are excellent. the box is rough. See photos. the cellophane is loose, but box does come with its insert. Up for bid is this Vintage early 70's Mego TARZAN he is missing his knife otherwise Mint in box . Box Is ORIGINAL, It is in very good condition, has some light wear & price sticker residue near logo area. Overall nice sharp solid shape. Great BMN price! Vintage 1973 Mego Tarzan Bend n Flex Bendy Nice!! Here's the 4th of four vintage Mego Bend n Flex figures that I have had stored away for the past 30 years. This one is Tarzan. He is in unplayed condition, meaning that I never bent or twisted the figure's arms, legs, or torso. His condition is very, very good -- see front and back pix. Color is still very vibrant and fresh. No damage to the figure, just a stray little spot here and there, but nothing major -- he's in amazing shape. Thanks a lot! Item: Mego Tarzan Bend n Flex Figure MOC. Description: An unused, all-original 1970s Mego Tarzan Bend 'n' Flex action figure from their World's Greatest Superheroes Line. This toy was never played with and has been stored away in a box for decades. It comes from the estate of a grandmother-- either she or her husband, at some point, bought these and stashed them away, perhaps intending to use them as Christmas presents. They have been out of the light and boxed away probably since they were originally purchased in the 1970s. 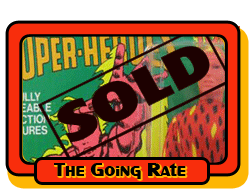 I WILL BE LISTING A BUNCH OF MEGO FIGURES THIS WEEK (WGSH 8" FIGURES AND BEND 'N' FLEX TOYS). CHECK OUT MY AUCTIONS-- ALL OF THE MEGO ITEMS THAT I AM SELLING ARE UNUSED, ALL-ORIGINAL, AND FROM THE SAME ESTATE FIND!!!!! I took several photos of this figure WITH and WITHOUT my camera's flash. The white spots in the photos are NOT on the actual item for sale-- they are just the flash's reflection. I will post photos of the rear of these figures' cards asap. In most cases, they show somewhat more wear than the fronts of the cards. Never stand behind a cow when it sneezes. 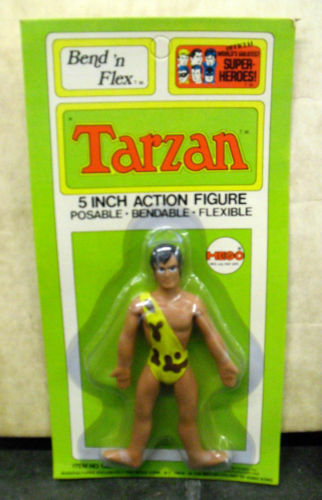 Here we offer a Mego 8" T1 body Tarzan! He is complete. Tarzan figure is 100% ALL ORIGINAL vintage 1970's Mego from head to toe, guaranteed. Early 1970's production Mego Tarzan figure is in FANTASTIC condition, showing absolutely no signs of play wear, outstanding. Mego Tarzan head shows no signs of play wear, very clean with great flesh tone to the head. Original mid 70's issue type 1 metal rivet jointed body is very tight, completely intact with NO defects whatsoever. Original Mego flesh tone bodysuit has very bright vintage color top to bottom. Super clean too. No runs, no stains, no seam splits, no holes and vintage snaps intact on back. Fantastic looking. Original vintage Mego printed animal skin loincloth is mint. Clean with original snaps intact on back, perfect. Original vintage Mego black knife has no scuffing/ splits, mint condition and completes this vintage Tarzan figure. A GREAT looking, ALL ORIGINAL Tarzan in the early issue type 1 body style. The Lord of the Jungle! One of the only non-Marvel, non-DC characters made by Mego. According to the description in the Mego Museum, this is a "Type 2" style, since it has Capt America on the front and an 8-count side bar. Be that as it may, I have been the sole owner since 1972. This is part of my original collection. with the understanding that she would buy me one to play with and one to save. This is the one that was saved. All parts are original. The box is original. He's never been removed from the box! Tarzan Mego Action Figure. In great shape. Figure has barely been played with. Outfit is clean with no tears. Two knives included. No discoloration on plastic. Box is in good shape also. Major flaws include price tag residue on Tarzan title panel in front, and inside front flap taped on, front only, but still connected at back by original cardboard. For sale is an unopened Tarzan from Mego's World's Greatest Super-Heroes. Card is unpunched. Card has yellow price tag. Some curvature to card, especially on left side. Some dirt, might could be cleaned up some, but would rather leave that to purchaser. Will ship priority mail to domestic addresses; international purchases will be shipped through Global Shipping Program. Real Nice vintage Mego action figure. 100% all original figure/box/uniform/knife. Some wear to back of box and on the lid. Figure seems virtually unplayed with. Some minor stray strands on costume. Original knife and original rubber band holding knife. No rips or tears in costume. Type 1 body. Contains original Child World price stickers. Comes with acrylic case for storage. Displays awesome and all original Mego! Very clean 8" scale size action figure: Tarzan, Lord of the Jungle! Original Body: Rare Type 2 muscular body version, marked Mego 1974. Joints all great- holds a pose and no cracks! Arms/legs held in place firmly - good elastics. Original Head: Marked 1972. Nice, clean paint with no visible hair rubs! Original Suit: Animal print loincloth has vibrant colors with no stains, rips or holes and the snaps firmly in place. Original bodysuit also in excellent shape with no stains, runs, rips or holes and snaps in place. Original knife accessory looks good! It has the correct "H.K." marking on the base of the blade. All times are GMT -5. The time now is 2:00 PM.